Greenfield Community College (I-91, Exit 26, Greenfield, MA). Begun in 1986 as a balloon festival, The Green River Festival has gained increasing popularity each year as more and more musical entertainment was incorporated. Today it has become THE summer musical event in Western Massachusetts, featuring the best national talent, the greatest local food and fine crafts. 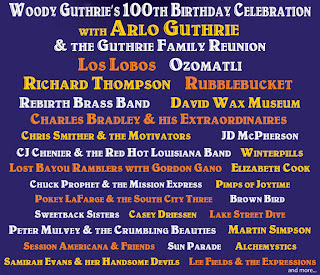 The 2012 lineup features a most amazing and eclectic mix of musical styles... including Folk music icon Arlo Guthrie, Los Angeles based Los Lobos and Ozomatli, Richard Thompson, Charles Bradley & His Extraordinaires and many others. There are three stages of music — the main stage, the dance tent (a fiesta for your feet!) and the River's Meltdown Kids' Stage — so there's something for everyone! Check the schedule page to find out when and where your favorite band is playing. Presented by the Franklin County Chamber of Commerce, not only does this celebration combines music on three stages, there is food, crafts, dancing, a wide array of kids activities and hot air balloon launches (weather permitting) for the Pioneer Valley's biggest outdoor event of the summer. This is the only music festival in Massachusetts that features hot air balloons and rides. Hot Air Balloons only inflate/fly early morning or as shown here in the evening when winds are minimal. Photo courtesy Rich Gastwirt. Mellow crowd and plenty of space as seen from the stage perspective. Photo courtesy Rich Gastwirt. The Green River Festival ticket prices are very reasonable (with kids 12 and under FREE), there is reasonably-priced onsite parking (with free parking and shuttle bus service also available), clean grounds (organizers goal is to work toward zero trash!) and safe for everyone! (sorry, no pets, alcohol or tents allowed).